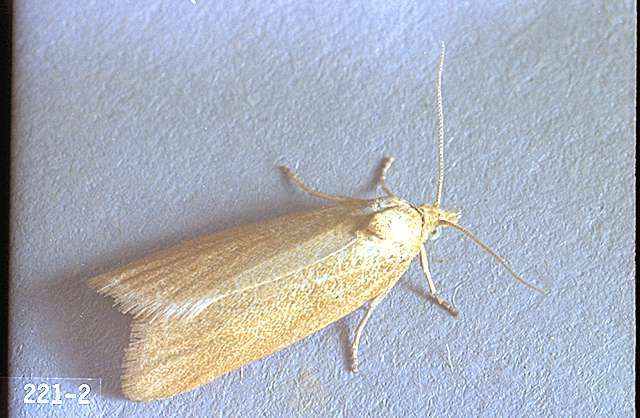 Pest description and crop damage The adult insect is a grayish-yellow, slender moth with brown markings about 12 mm long. The larvae are up to 12 mm long, dirty white, with a brownish head. The larvae web leaves and flowers together and feed on and tunnel into ripe and unripe fruit. 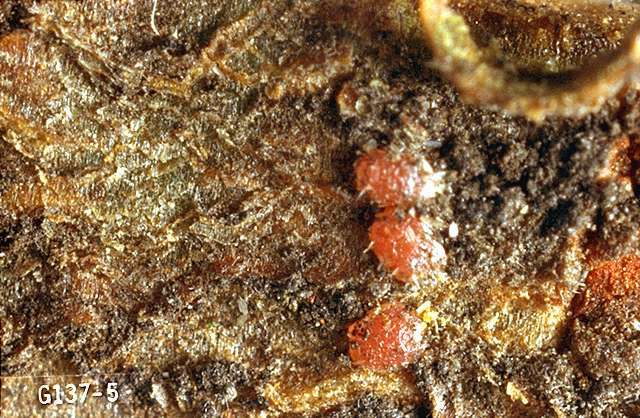 Injured berries also contain excrement left by the larvae in the tunnels. One larva can damage several berries. Damage often can be seen on green berries immediately after fruit is set. 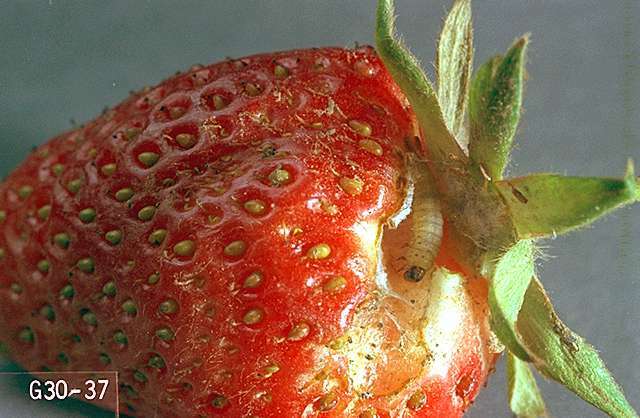 Biology and life history The insect overwinters in silken cases as a young larva on the bark of trees and other rough surfaces, but not on strawberry plants. In spring, the larvae spin silken threads, and are carried by wind to host plants which, besides strawberry, include Dutch iris, hops, filbert, pear, clover, and plantain. 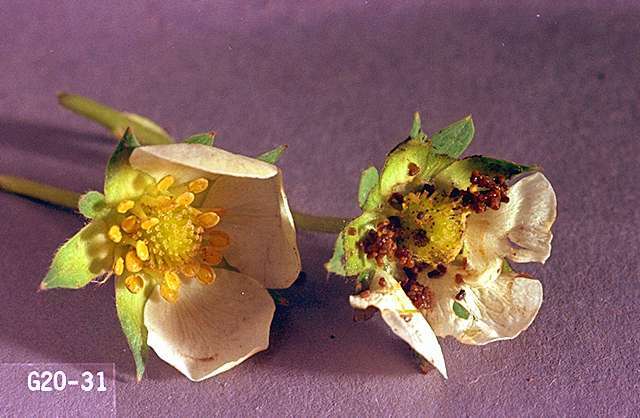 On strawberry, the larvae web the leaves and flowers together beginning in late April, then feed on the developing fruit. The moths appear in June and July and lay eggs. There is one generation per year. Scouting and thresholds Watch for signs of leaf webbing in late April. Floating row covers placed over the plants after spring growth begins, and removed after bloom begins, will exclude larvae. Remove any webbed leaves or larvae that are found. If you use sprays, time them to coincide with the appearance of the first blooms. Do not treat when blossoms are open, in order to avoid bee poisoning. carbaryl-Apply when there are more than two larvae per plant. A repeat application may be necessary in 3 weeks. Bacillus thuringiensis (Bt) (several brands)-Consult label for rate. PHI 0 days. Do not tank mix DiPel ES with captan or other fungicides that are not compatible with spray oil; the mixture will bronze foliage. Some formulations OMRI-listed for organic use. carbaryl (Sevin and other brands) at 1 to 2 lb ai/a. PHI 7 days. Latex-based formulations such as Sevin XLR Plus are less hazardous to bees. Do not apply to blooming plants. chlorantraniliprole (Coragen) at 0.045 to 0.065 lb ai/a. PHI 1 day. Do not exceed 0.2 lb ai/a per crop season. flubendiamide (Belt) at 0.075 lb ai/a. PHI 8 days. Do not exceed 0.225 lb ai/a per crop season. naled (Dibrom) at 0.9 lb ai/a. PHI 1 day. Apply during late evening, night, or early morning to avoid bee poisoning. pyrethrin (several brands)-Consult label for rate and use directions. PHI 0 days. Pyganic brand is OMRI-listed for organic use.